Cambridge University Press, 9780521361699, 632pp. 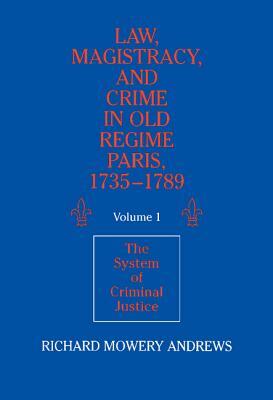 This book is the first of two volumes centered around the two great courts of Paris, the Chatelet and Parlement, and their criminal defendants in the eighteenth century. Richard Andrews refutes the "black legend" of Revolutionary propaganda and its modern historical successors, which hold that the Old Regime courts were cruel and arbitrary. The author places the courts of Old Regime Paris in the context of French society and the state, and examines the practices and doctrines of punishment, along with the jurisprudence of moral and criminal behavior. By reconstructing the general system of royal criminal justice, Andrews explores the political system connected to it: the formation, authority and ethos of the magistracy and its relation to the monarchy, the Church, the aristocracy, the bourgeois and the plebians.